Individually tested at 10,000V, guaranteed safe at 1,000V (EN60900:2012). With 2x Kraftform design multi-component handles and 15 x interchangeable insulated blades. Secure locking system. Set contains: 2 Kraftform insulated handles, PH1, PH2, PZ1, PZ2, Pozi Plus-Minus MCB PZ/S #1, #2, TX10, TX15, TX20, TX25, SL2.5 x 0.4, SL4.0 x 0.8, SL 5.5 x 1.0, SL6.5 x 1.2, 1 Slim RCBO slotted 3.5 x 0.6 VDE blades and a durable belt pouch. 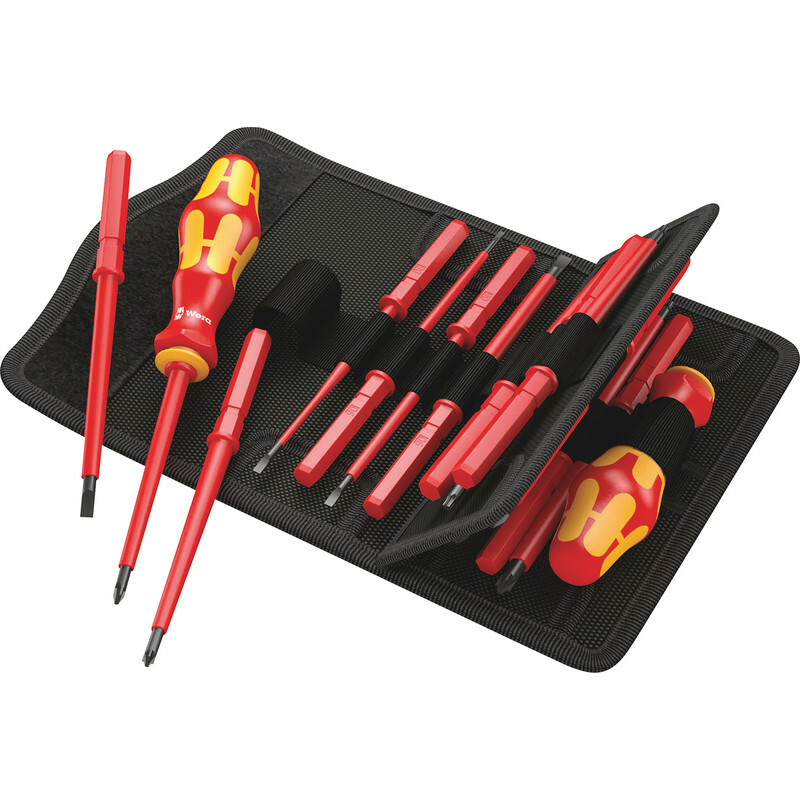 Wera Kompakt VDE Twin Handle Screwdriver Set (17 Piece) is rated 5.0 out of 5 by 5. Rated 5 out of 5 by GigaMart from Brilliant set Excellent quality set with a great selection of sizes, as a spark the flatties get the most use, but seems to be a perfect size for everything I've come across. Super lightweight and ergonomic design makes these a breeze to use, well recommended. Rated 5 out of 5 by Ra100 from Wera screwdrivers Very happy with purchase. Professional tools, compact pouch for store what perfect fit on the belt. Rated 5 out of 5 by stenches from Best electricians screwdriver set I've had these WERA screwdrivers before,This sets got the added advantage of an extra handle,carry 15 drivers in your pocket superb.